Showing items in category Uganda, sorted by newest listed first. 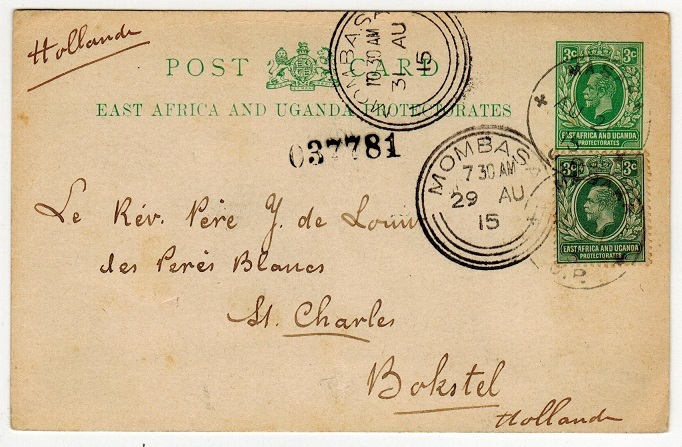 UGANDA - 1912 3c green PSC (crease) to Holland written at 'Bikira' and sent from MASAKA. H&G 9. 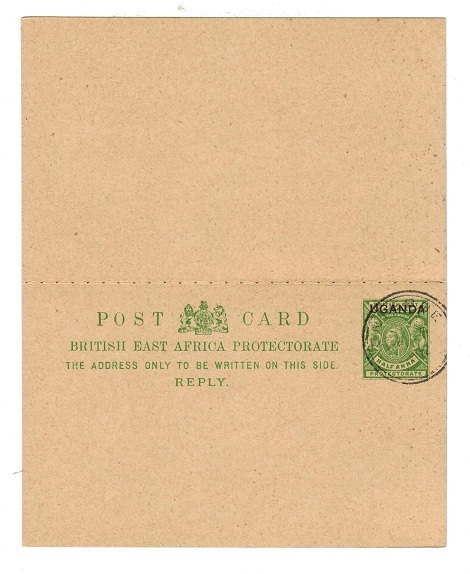 1912 3c green on ivory postal stationery postcard of East Africa addressed to Holland (central fold ironed out) written and annotated as such from 'Bikira' bearing additional 3c adhesive tied by s/r MASAKA/UGANDA cds dated AU.21.15. MOMBASA transit at left. A rare origin. H&G 9. UGANDA - 1903 1a rate cover to UK used at KAMPALA. 1903 (AP.18.) 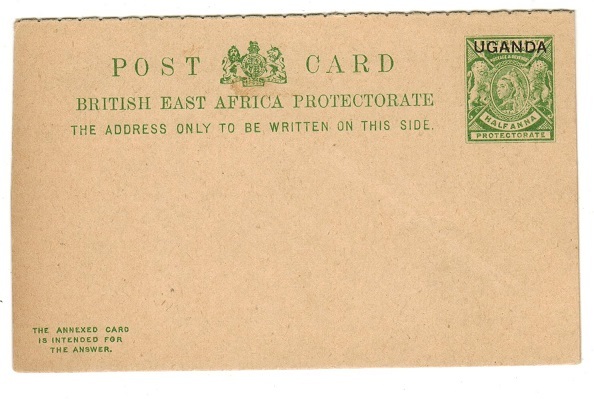 cover addressed to UK bearing 1a adhesive tied by s/r KAMPALA/UGANDA cds. 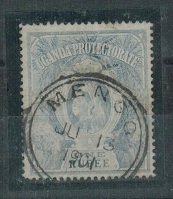 UGANDA - 1902 1a rate cover to UK used at MENGO. 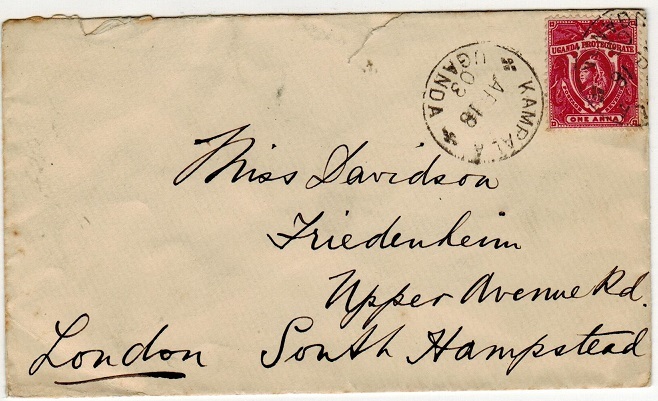 1902 (FE.15) cover to UK bearing 1a adhesive (SG 84a) tied by fine d/r MENGO cds with s/r MOMBASA transit b/s. A scarce cover sent from the Church Mission Society. UGANDA - 1896 8a black handstamped 'L' with Consular use. SG 74. 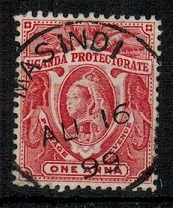 1896 8a black 'Rowling' adhesive handstamped 'L' for local use by R.Racey at Kampala cancelled by part crested 'Royal Arms' strike used by the Consular. SG 74. 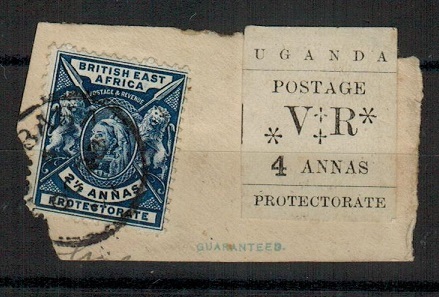 UGANDA - 1896 1a black 'L' handstamped adhesive used. SG 70. 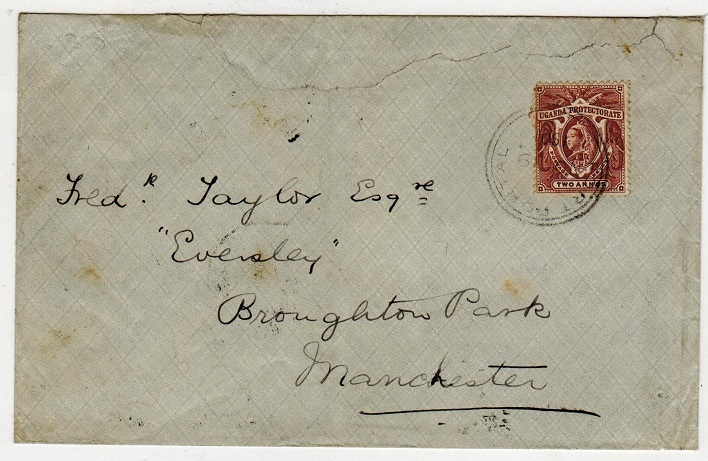 1896 1a black 'Rowling' adhesive handstamped 'L' for local use by R.Racey at Kampala cancelled with manuscript cross. SG 70. UGANDA - 1901 2a rate cover to UK used at FORT PORTAL. 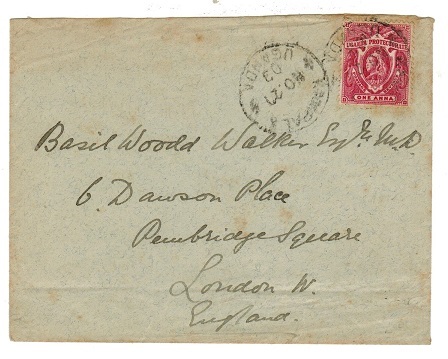 1901 (NO.19) cover to UK (rough opening at top repaired) bearing 2a (SG86) tied by d/r FORT PORTAL cds. (Proud type D2). UGANDA - 1905 1/2a green pair struck by FORT PORTAL cds in red ink. 1905 (AP.19.) 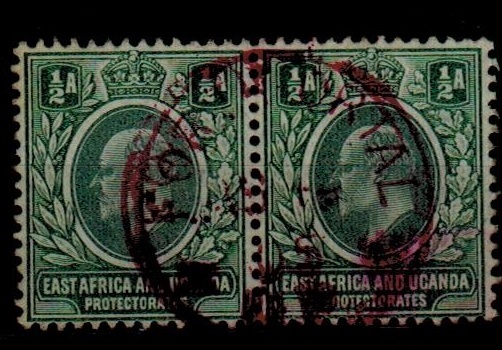 use of 1/2a green 'East Africa' adhesive pair (SG 17) cancelled by FORT PORTAL/ UP cds in 'red' ink. Very scarce thus. UGANDA - 1902 1/2d+1/2d green PSRC unused. H&G 3. 1902 1/2d+1/2d green on buff postal stationery reply type postcard in unused condition. Very small stain on crest. H&G 3. UGANDA - 1898 1r dull blue (SG 90) overprinted INLAND REVENUE and used at MASINDI. 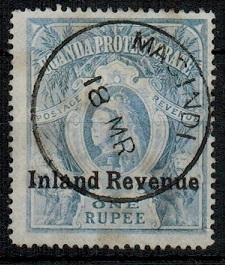 1898 1r dull blue adhesive (SG 90) overprinted INLAND REVENUE in black and cancelled by central MASINDI cds dated 18.MR (no year slug). Barefoot and Hall No.6. UGANDA - 1896 4a tied in combination with BEA 2 1/2a by MOMBASA cds. 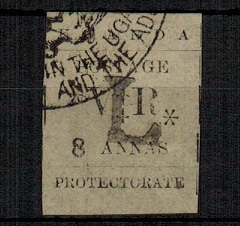 1896 4a Black (Rowling) adhesive (SG58) on piece & in combination with B.E.A. 2 1/2a Blue (SG68) tied by large part circular MOMBASA cds. Arch Deacon Walker period acting as Postmaster & hence uncancelled. (Overseas mail). UGANDA - 1898 1a scarlet struck MASINDI. SG 84. 1898-1902 1a scarlet (SG 84) cancelled by superb central MASINDI cds. (Proud type D1). Scarce. UGANDA - 1954 10/- black and blue UGANDA/REVENUE unmounted mint. 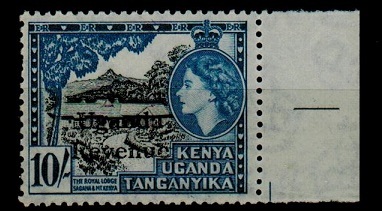 1954 10/- black and blue unmounted mint marginal example overprinted UGANDA/REVENUE. Barefoot 116. UGANDA - 1907 1c brown U/M block of four overprinted UGANDA/REVENUE. 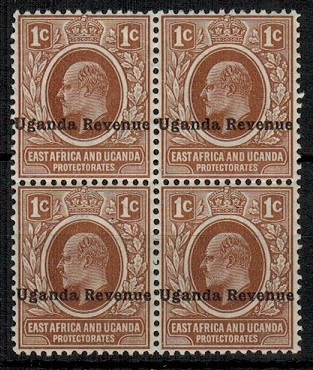 1907 1c brown unmounted mint marginal block of four of the East Africa adhesive issue (SG 34) each overprinted UGANDA REVENUE. 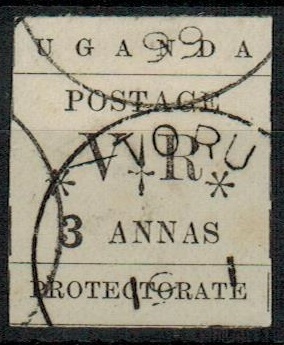 UGANDA - 1898 combination cover to UK with 4a showing SMALL O IN POSTAGE variety. 1898 (DE.5.) 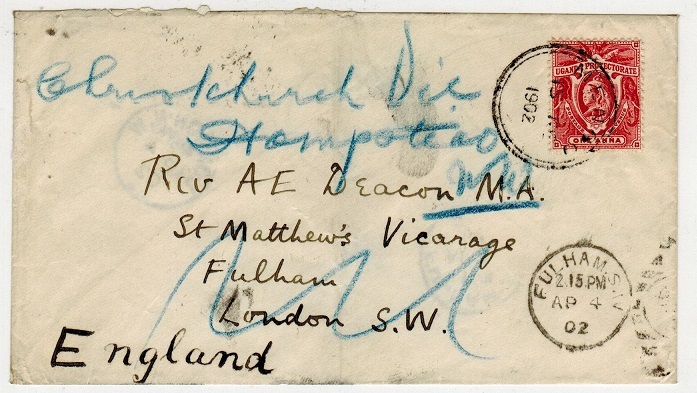 thick blue cover with lined interior addressed to UK (tear at top right repaired) bearing British East Africa 2 1/2a adhesive (corner fault) cancelled by MOMBASA cds and tied in combination with Uganda 4a black with blue crayon cross strike and showing the SMALL O IN POSTAGE variety from Row 3/1. (SG 58a). ZANZIBAR transit b/s and LONDON arrival. UGANDA - 1902 2a red-brown RPSE to Mombasa bearing 1/2a (x6) used at ENTEBBE. H&G 1. 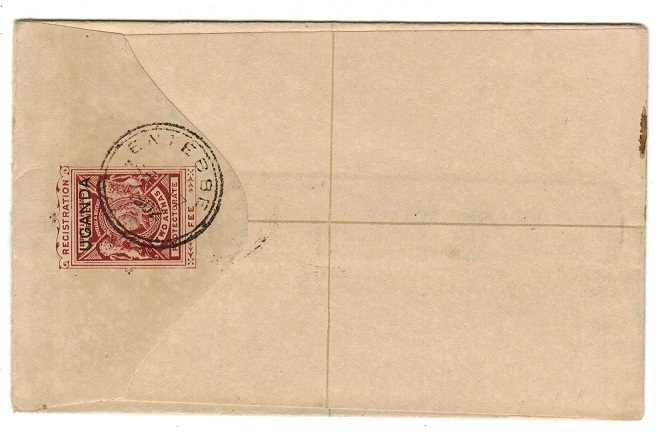 1902 2a red-brown on cream registered postal stationery envelope (size F) addressed locally (Dewjee Jamall) bearing a fine strip of six of the 1/2a yellow-green adhesive (SG 92) tied by ENTEBBE d/r cds's dated SP.17.1902. H&G 1. UGANDA - 1896 3a adhesive cancelled TORU. SG 57. 1896 3a black adhesive cancelled by TORU s/r cds dated 19.1.99. (Proud type D1). SG 57. 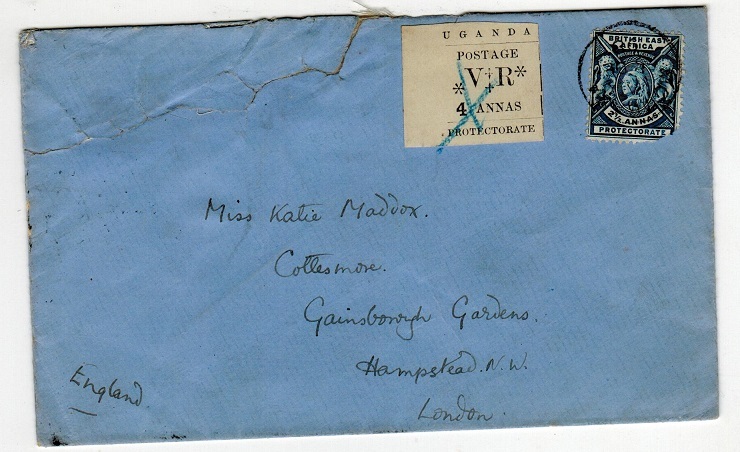 UGANDA - 1903 cover to UK used at KAMPALA. 1903 (NO.27.) 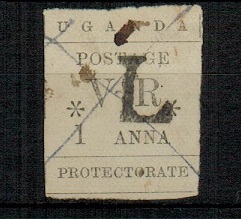 cover addressed to UK bearing 1a adhesive (SG 84a) tied by KAMPALA/UGANDA cds with a further strike at left. MOMBASA transit b/s. 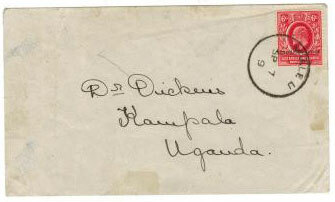 UGANDA - 1902 OHMS cover from BUDDU. 1902 (APR.3.) 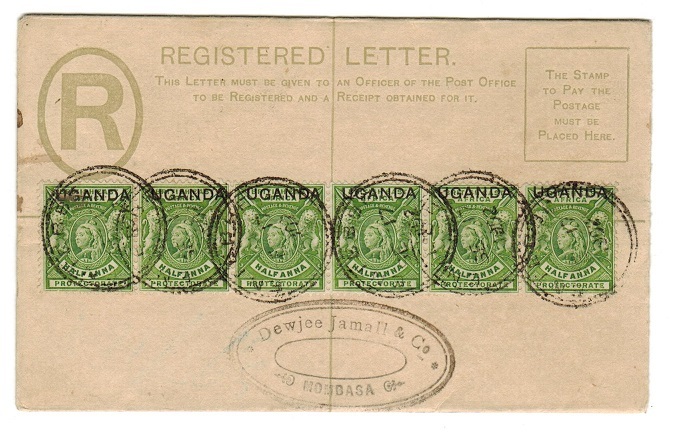 use of a very large 'On Her Britannic Majesty's Service' envelope (355x150mm) addressed to Mombasa but then re-directed bearing 40 examples of the BEA 1/2a green adhesive overprinted 'UGANDA' (SG 92) mainly in vertical pairs (8 on reverse) tied by rare single ringed BUDDU cds's (Proud type D2). The cover has been folded and there are a few creasing faults on the stamps accordingly. KAMPALA transit b/s. A stupendous usage however at a 2 rupee rate from Buddu. UGANDA - 1902 2 1/2a (SG 93) tied to piece by full BUDDU cds. 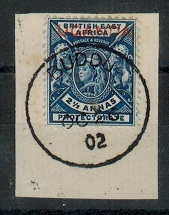 1902 2 1/2a deep blue (SG93) tied to piece by superb single ringed BUDDU cds dated OC.26.02. Scarce. 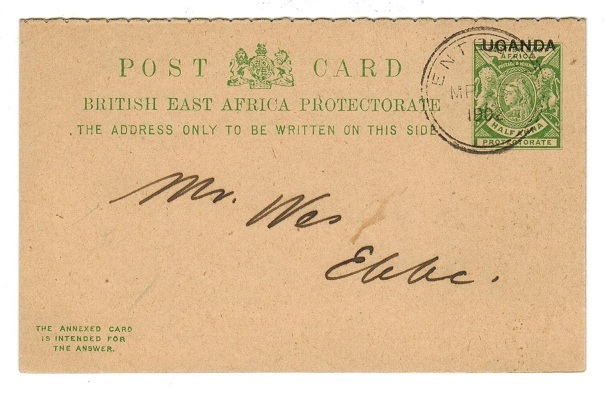 UGANDA - 1902 1/2a+1/2a RPSC (no message) cto'd at ENTEBBE. H&G 3. 1902 1/2a+1/2a yellow-green on buff reply type postal stationery postcard (no message) cto'd ENTEBBE and dated MR.5.1902. The reply section additionally cancelled. H&G 3. UGANDA - 1898 1r (SG 90) cancelled by central MENGO cds. 1898-1902 1r dull blue cancelled by near complete MENGO cds dated JU.13.1901. SG 90. UGANDA - 1909 cover to Kampala with 6c UGANDA REVENUE used at MBALE. One of only 6 known covers.